VietPress USA (July 19. 2018): Congress and even Trump's director of national intelligence, Dan Coats, said he did not know what happened in Helsinki. But today the White House spokeswoman Sarah Sanders said in a Twitter posted that Trump had directed national security adviser John Bolton to issue the invitation to invite Russian President Vladimir Putin to visit Trump in Washington DC this autumn. Nobody including U.S. Lawmakers from both Parties and top officials in Trump's administration has been informed what Trump and Putin secretly discussed on last Monday summit in Helsinki. It's now Trump decides to invite Putin to White House... but what for? WASHINGTON (Reuters) - President Donald Trump plans to invite Russian President Vladimir Putin to Washington this autumn, the White House said on Thursday, four days after a summit that led to an uproar in the United States over Trump's failure to publicly confront Putin for Moscow's meddling in the 2016 U.S. election. White House spokeswoman Sarah Sanders said in a Twitter post that Trump had directed national security adviser John Bolton to issue the invitation, even though U.S. lawmakers and top officials in Trump's administration have not been briefed on what Trump and Putin discussed in Monday's summit with only interpreters present. Even Trump's director of national intelligence, Dan Coats, said he did not know what happened in Helsinki. "Well, you're right, I don't know what happened at that meeting," Coats said in response to a question at the Aspen Security Forum in Colorado. The coveted invitation to Washington was sure to be seen as a victory by Putin, whose last official visit to the United States was in July 2007, when he spent two days at the Bush family compound in Kennebunkport, Maine. Both Trump and Putin earlier on Thursday praised their first meeting as a success and blamed forces in the United States for trying to belittle its achievements. Despite the week's furor, Trump also said he was looking forward to his second meeting with the Russian leader. Top Senate Democrat Chuck Schumer immediately criticized the planned invitation. "Until we know what happened at that two hour meeting in Helsinki, the president should have no more one-on-one interactions with Putin. In the United States, in Russia, or anywhere else," he said in a statement. The last official visit by a Russian president to the United States was in June 2010, when Dmitri Medvedev, now Russian prime minister, visited the United States. The White House, with Trump under fierce criticism in the United States, did on Thursday reject Putin's proposal that Russian authorities be present for the questioning of Americans it accuses of "illegal activities," including a former U.S. ambassador to Moscow. 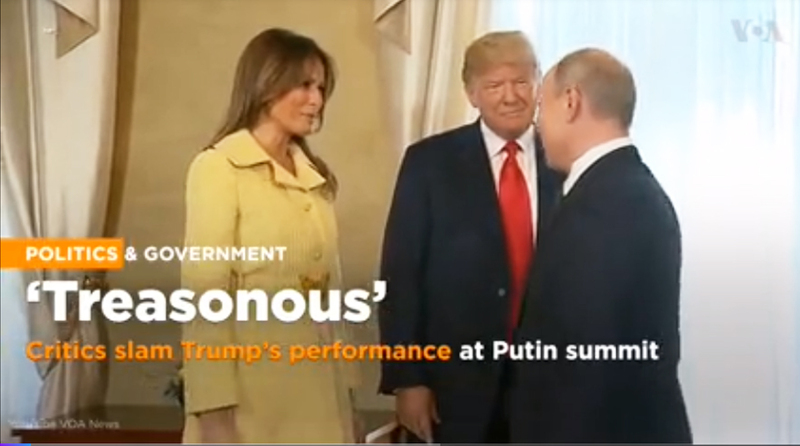 It was the latest about-face from the White House as it struggled to quiet the post-Helsinki summit uproar. Critics complained that Trump was given ample opportunity at a joint news conference on Monday to scold Putin over Russian interference in the U.S. election but instead accepted Putin's denials over the word of American intelligence agencies. Republican and Democratic U.S. lawmakers grappled with Trump's conflicting statements about the summit and what they did not know: exactly what the two leaders discussed and what agreements, if any, were reached. In a rebuke to the president, the Senate - controlled by Trump's fellow Republicans - unanimously approved a resolution expressing congressional opposition to any U.S. officials being questioned with Russian officials. At Monday's news conference, Putin described the proposal when he was asked about the possible extradition of 12 Russian intelligence officers indicted in the United States on charges of meddling in the 2016 election by carrying out cyber attacks on Democratic Party networks. "It is a proposal that was made in sincerity by President Putin, but President Trump disagrees with it," Sanders said on Thursday, a day after saying the proposal was going to be discussed by Trump's team. "Hopefully President Putin will have the 12 identified Russians come to the United States to prove their innocence or guilt." On Wednesday, the Russian Prosecutor General's office listed Americans it wanted to question for "illegal activities," including Michael McFaul, who was U.S. ambassador to Russia under Democratic former President Barack Obama. In Twitter posts on Thursday morning, Trump accused the news media of distorting comments in which he gave credence to Putin's denials of election interference. "The Summit with Russia was a great success, except with the real enemy of the people, the Fake News Media," Trump wrote. "I look forward to our second meeting so that we can start implementing some of the many things discussed," Trump said, citing terrorism, Israel's security, nuclear proliferation, cyber attacks, trade, Ukraine, Middle East peace and North Korea. In Moscow, Putin said the summit " was successful overall and led to some useful agreements" without elaborating on the agreements.